We have american cocker spaniel, basset hound, beagle, boxer, bulldog, bull mastiff, dachshund, dalmatian, english cocker spaniel, english mastiff, french bulldog, german shepherd, golden retriever, great dane, labrador retriever, lhasa apso, miniature pinscher, neopolitan mastiff, pekingese, pug, rottweiler, st. Bernard and many more. Dog Cage 24" x 18"
DOG CAGE Give a Beautiful home Your Dog in a Unique Style. Attractive Dog Cage a gift for your Dog from Pet Zone J. Hi! Dog Keep calm & Rest in your Home. 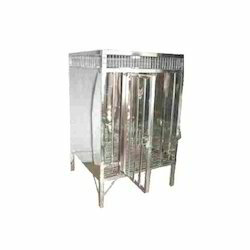 Our company is occupied in providing a wide series of Dog Bucket.